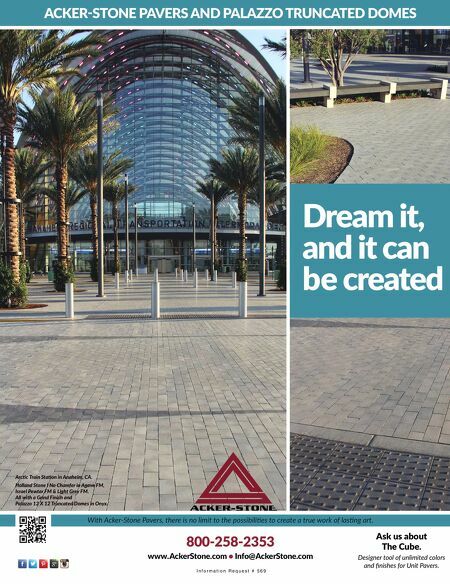 82 Landscape Architect and Specifier News the landscape architect to create a memorable driveway and auto court. The original schoolhouse was located on the north side of the newly constructed home. The landscape architect needed to showcase the schoolhouse in a way that complemented the new home, while not dominating the front yard. Northland's landscape architects carefully designed and placed a heritage rose garden that nudges the visitor's attention to the smaller school house structure, while providing an appropriate edge to the new home's front yard. Crushed limestone paths mixed with stabilizer connect the site. The stabilizer binds the stone, providing a rich walking experience into the back yard and through the rustic stonewalls and iron gates. The family gathering space is warmly lit with a lamppost, a moveable fire feature and presents colorful flowerbeds. The stone seat benches are rock from the 1880 structure; the original adobe bricks were used as part of the base for the benches. The backyard was designed for gathering. Intimate patio spaces are separated from the large covered porch by short stone garden walls, and surrounded by daylilies and ornamental grasses. These walls beckon children to come and play, providing a wonderful architectural extension of the home that mimics the newly placed rock on the home and schoolhouse foundation. The backyard focal point is the stunning brick fireplace custom designed by Northland Design Group. It replicates details from the home's chimney and the historic 'teardrop' brick patterns around the old school house windows. This space is where family memories are created, which leads back to the underlying goal of the owners: to bring their family together and to connect to their past. Above, Left & Inset The planting bed along the stone seatwall, separated form the lawn with Sure-Loc steel edging, offers 'Karl Foerster' feather reed grass, and Gaura 'Whirling Butterflies.' The home's turfgrass selection was 'Bella' Bluegrass (inset), developed at the University of Nebraska. It's noted for drought and shade tolerance, dwarf and dense growth habit, dark green foliage and shorter leaves. Right & Below, Right The home design called for a creative design solution for the driveway. The desire was to minimize the presence of hardscapes that were not present when the site was originally built. The solution was a carriage path driveway designed by the landscape architects in careful coordination with the architect of the new attached and detached garages to create a distinctive auto court. Kwanzan cherry trees are positioned on either side of the carriageway. Structural soil was specified around and between the carriage path drive to ensure a stable surface for driving. Such soil not only helps support the weight of vehicles, but maintains a good soil environment for root establishment. Quarzitic sandstone pedestals support the wrought iron fencing. Black-eyed Susans and 'Pardon Me' Daylilies are among the welcoming plants.